"Wow! Ang galing-galing!" I exclaimed while jumping up and down. My husband was looking on in amazement wondering probably if I had discovered the cure for cancer in my kitchen. "I made chicharon!" I shouted as the pork skin started to expand and pop in my frying pan. I think I have reached a peak in my quest for Filipino cuisine culinary expertise. Not even in my wildest dreams have I thought I could make chicharon. Shallow? 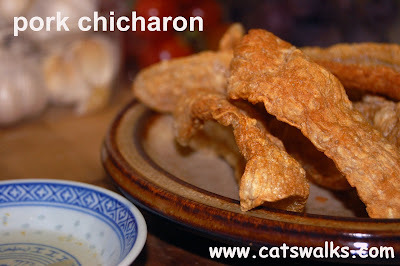 There is a reason why chicharon is found in every street corner in the Philippines. Filipinos love chicharon. Some dishes are not complete if not laced with these cholesterol-filled wonder. La paz batchoy without chicharon? Incomplete. Palabok without chicharon? Definitely incomplete. Me eating chicharon? Happiness. Please visit my food blog "Bubut's House" for the recipe and complete story.